Welcome to Fertile Ground's new home for Contemporary Circus & Aerial Arts! 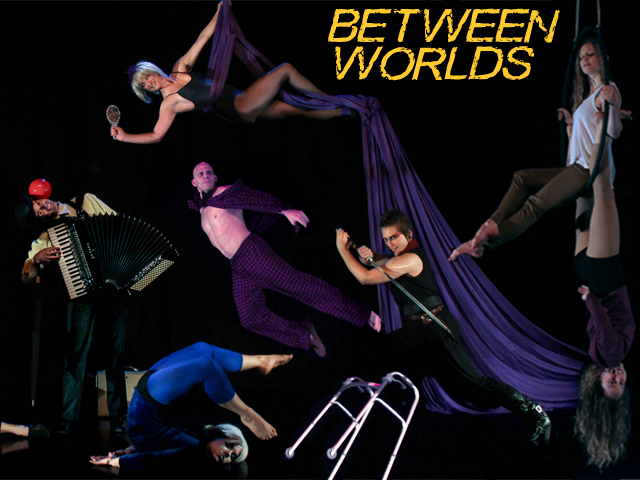 Between Worlds is an opportunity to see three original works exploring themes of heroism, light and darkness, and human potential using aerial dance, acrobatics, dance, theatre, music and puppetry. Between Worlds is an experiment, three companies presenting work that is on the road to completion and have an opportunity to provide feedback to the directors. Each company has a distinct style, voice and approach to creating work within this particular niche. "Super Hero Old Folks Home" is inspired by the world of comic book mythology, directed by Aaron Wheeler-Kay. It is about our complicated relationship with our elders, the lessons they teach, and what it means to be the hero of our own stories. Featuring artists of all ages and physical abilities. The Circus Project explores the themes of theÂ Seven Deadly SinsÂ under directors Russ Stark and Alicia Cutaia. Refracting multiple movement arts through the choreographic lens of Bob Fosse, performers will embody the universal struggle against "sin" transporting the audience through a world where sin is the way of life. Will they emerge a better person for the journey or be lost to the power of the "Seven"? Tempos tells the story of the hero's journey based on Joseph Campbell's work. Through flight, physical theatre and dance, the audience will follow one man's journey as he is transformed from an everyday man into his own personal hero.